Is there any scrap of New Zealand left not plastered with Hobbit advertising? This week New Zealand, will host the premiere of Peter Jackson's The Hobbit: An Unexpected Journey. Which means the tornado of marketing insanity has been set loose on the Shire leaving absolutely no Kiwi un-swaddled by an Elven cloak. Here's what it looks like when Warner Bros. buys an entire town. We've all seen Air New Zealand's adorable fight safety video (featuring Jackson himself!). 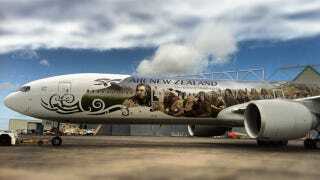 Well today, the airline revealed an entire plane painted up like a Hobbit movie poster. And when passengers exit their Hobbit plane they will be met by a giant Gollum, swiping in the air for some fresh fish! You haven't even left the airport when a third bit of Hobbit advertising smacks you in the face — and this is assuming you didn't stop and shop at the elf-ear gift shop at the airport. The baggage carousel is made over into a Hobbit hole. All this, before setting foot on actual New Zealand soil. The New Zealand Post Office has an admittedly beautiful collection of marching silhouettes, each depicting a different character from the movie. Wellington built a Hobbit Artisan Market, where people could roam through a tented wonderland of Hobbit art and other fineries. Or you could just sit there and watch a bit of Lord of the Rings, which is running on a giant outdoor screen 24/7 (which is actually quite cool). Hobbit Market via Kyiam's Tumblr. Random businesses have wrapped themselves in fake panoramas pulled from Jackson's Middle-Earth. Photograph by RAIG SIMCOX/Fairfax NZ. To top it off, Wellington has officially changed its name to "Middle of Middle-Earth," which is certainly a mouthful. The town has also commissioned official stamps and honest-to-goodness NZ coins with the faces of actors on them. It's all fairly insane, especially since Warner Bros has to approve every marketing ploy dreamed up by the New Zealanders. And we've still yet to see a bunch of black-market Hobbit merch making the rounds. Come on Kiwis — we know you've got some terrible knockoff Hobbit T-Shirts to peddle to the masses! We can only pray that this town-turned-theme park goes to the dark side of the marketing world and fast — we want a Billbong and Frodope tee.